The Fix it Sticks Replaceable Edition will be reviewed in this article, just as the Tire Levers that were released by Brian Davis and his team around December 2016. The tire levers are specifically designed for Fix it Sticks Replaceable Edition and can be placed on the end of Fix it Sticks instead of a 1/4″ bit. I will compare the replaceables with the Fix It Sticks T-Way wrench and the Fix It Sticks Tire Levers with my Tacx Mini Tyre levers T4885. When Brian Davies and his team launched a replaceable edition of the original Fix It Sticks, I decided to get me a pair together with the T-Way wrench. 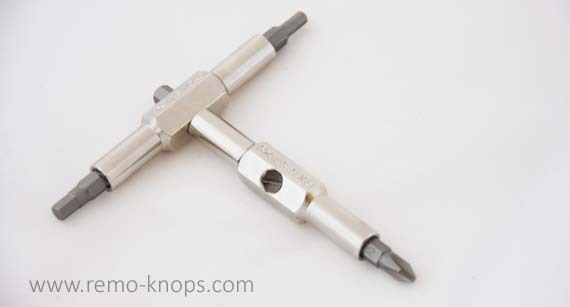 A couple of years ago I started to use a good set of PB Swiss Tools 1/4″ bits in combination with a Hazet 2262 holder (and thus I moved away from using traditional screwdrivers). While the set comes with 8 bits, I’ve replaced them with PB Swiss bits, just a matter of preference and not a matter of quality. The Fix It Sticks feel solid and robust due to the all steel construction, but therefore slightly on the heavy side. According to specifications the Replaceable Fix It Sticks weigh 118 grams. Neodymium magnets snap the 1/4″ bits securely in place and keep them in place. In addition you can snap both sticks together (when bits are placed) to apply extra force when needed. Theoretically you could also put a spanner on the middle section of the Fix It Stick, but I never needed to have that extra leverage. The Fix it Sticks Replaceable Edition is a very handy tool, not only to work on your bike but also for using in your garage or around the house. After more than a year of use there are even no signs of any wear. The Tire Lever for Replaceable Fix It Sticks is the latest brain child of serial entrepreneur Brian Davis. You simply snap on the Fix It Sticks Tire Levers like any other bit (simply due to the molded in bit). You will also here the securing click of the neodymium magnets. The length of the Fix It Stick with a Tire Lever attached is exactly the same as the Pedros Tire Levers. The curve of the Fix It Sticks Tire Lever head is also slightly higher and therefore a fraction better to grab under the steel cable in the outer tire. With the all steel Fix It Sticks attached to the Tire Lever I don’t foresee any problems, even with the hardest tires. The Pedros Tire Levers are my benchmark here and there is no tire that I could not remove. Only area where the Pedros Tire Levers could win is the price-point. The Fix It Sticks Tire Levers are for sale for $ 10,- while the Pedros Tire Levers have a price-point of $ 5,–. However the Fix It Sticks Tire Levers perfectly integrate with your Fix It Sticks. The Fix It Sticks Tire Levers perfectly integrate with your Fix It Sticks replaceable edition. So the Fix It Sticks become even more a multi-repair-tool. Fix It Sticks replaceable edition have the same shop quality as the Fix It Sticks T-Way wrench, which will result in a long technical lifespan of the tools. The Fix It Sticks replaceable edition can be ordered for $ 30,- which is a fair price point for the quality and features you get (personally I would consider the combo-pack with the T-Way wrench). Whats Fix It tools do you own and what do you think of the Fix It Sticks Tire Levers ? Again final and special thanks go to my Philadelphia based cycling friend who ordered the Fix It Sticks Tire Levers for me provided and me with the tip to review the Banjo Brothers Jersey Pocket Cycling Wallet. Hey!, I found this information for you: "Fix It Sticks Replaceable Tire Levers". Here is the website link: https://www.remo-knops.com/5841/fix-it-sticks-replaceable-tire-levers/. Thank you.